During times of unsafe road conditions, you may experience some service delays and disruptions. Our top priority is the safety and well-being of our team members and the public, as well as providing the highest level of service to our customers. 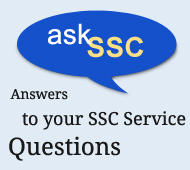 SSC is committed to providing service to the best of our ability in areas that can be safely accessed. If we cannot collect material on your regular service day due to unsafe road conditions, please leave your container(s) out at the curb (or alley). We will collect material as soon as possible. This may be the next business day or the next time we are scheduled to service your area. Please brush snow off containers. Windy weather info and tips to prevent windblown litter are here. If we do not service your account until your next regularly scheduled service day, we will take extra material at no extra charge (not to exceed an amount that would be reasonably generated as a result of missed pick up). Use plastic bags for extra garbage. Your patience and understanding is appreciated as we work to safely collect all materials during these times.